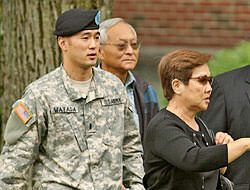 Forty months after publicly refusing to deploy to Iraq, Army finally surrenders and accepts resignation of outspoken officer Lt. Ehren Watada. Fort Lewis stockade officials are attempting to cut off prisoner of conscience Travis Bishop from friends, family and lawyers. Leo Church, convicted of AWOL, also effected. Bethany Smith (aka Skyler James) explains why she refused to deploy to Afghanistan to a Canadian federal judge in her appeal to remain in Canada. Help. Can you be 1% of the solution? Courage to Resist has identified significant reductions in our budget and have made hard decisions; however, we need your help to bridge our current funding gap. The Army is allowing the first commissioned officer to be court-martialed for refusing to go to Iraq to resign from the service, his attorney said late Friday. First Lt. Ehren Watada will be granted a discharge Oct. 2, "under other than honorable conditions," attorney Kenneth Kagan said. Watada told the Honolulu Star-Bulletin he was happy the matter has finally been closed. "The actual outcome is different from the outcome that I envisioned in the first place, but I am grateful of the outcome," he said. Fort Lewis spokesman Joseph Piek wouldn't confirm Watada's type of discharge, citing privacy rules. But he said late Friday that Watada's manner of resignation is described in Army regulations as "resignation for the good of the service in lieu of general court martial." The Army has continued to assert that they had a right to court martial Ehren on the two speech-related charges that were set aside during the February 2007 trial. The Army had not moved forward with pressing those charges as they would have likely failed to get a conviction, in turn setting a clear free speech precedent for troops. 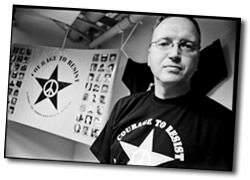 However, the Army have kept Ehren on indefinite legal hold based on those charges following the federal court ruling in his favor. In order to fight for an honorable discharge in federal court, Ehren might have had to remain in the Army's legal limbo for another two years. Watada, 31, refused to deploy to Iraq with his Fort Lewis, Washington-based unit in 2006, arguing the war is illegal and that he would be a party to war crimes if he served in Iraq. The Honolulu-born soldier was charged with missing his unit's deployment and with conduct unbecoming an officer for denouncing President Bush and the war — statements he made while explaining his actions. 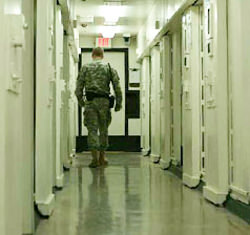 His court-martial ended in mistrial in February 2007. The military's treatment of Army prisoners is "part of a broader pattern the military has of just throwing people in jail and not letting them talk to their attorneys, not letting visitors come, and this is outrageous. In the civilian world even murderers get visits from their friends," according to civil defense attorney James Branum. Afghanistan war resister Travis Bishop has been held largely "incommunicado" in the Northwest Joint Regional Correctional Facility at Fort Lewis, Washington. Bishop, who is being held by the military as a "prisoner of conscience," according to Amnesty International, was transported to Fort Lewis on September 9 to serve a 12-month sentence in the Regional Correctional Facility. He had refused orders to deploy to Afghanistan based on his religious beliefs, and had filed for Conscientious Objector (CO) status. years. Bishop, who served a 13-month deployment to Iraq and was stationed at Fort Hood, Texas, was court marshaled by the Army for his refusal to deploy to Afghanistan. Given that he had already filed for CO status, many local observers called his sentencing a "politically driven prosecution." By holding Bishop incommunicado, the military violated Bishop's legal right to counsel, a violation of the Sixth Amendment to the US Constitution, according to his civil defense attorney James Branum. A lesbian soldier who deserted the U.S. military appealed to a Canadian judge for asylum Tuesday, claiming she was repeatedly harassed and threatened with death, then denied a discharge because her superiors wanted to send her to Afghanistan. Private Bethany Smith, who adopted the name Skyler James upon fleeing to Canada two years ago, took her case to Federal Court after being rejected as a refugee by the Immigration and Refugee Board. ...Smith, who says she was outed by a soldier who spotted her walking hand-in-hand with a woman at a shopping mall, contends in court documents that she was badgered daily, saddled with extra work by her superiors and received more than 100 threatening notes on her dormitory door, including a death threat. Smith served at Fort Campbell, in Kentucky, the same base where a gay soldier was beaten to death with a baseball bat in 1999. Can you be one percent of the solution? I’m writing today out of urgent necessity. Over the past 12 months, we’ve continued to support GI resisters to the best of our abilities, yet many of our supporters reduced the amount of their contributions—for a number of understandable reasons. As a result, Courage to Resist has depleted nearly all of our resources. We have identified significant reductions in our budget and have made hard decisions—including reducing staff hours by 50% and moving our Oakland-based workspace saving 40% on office-related expenses. We are making these changes now so that we can provide critical support for the growing opposition to the Afghanistan occupation from within the military tomorrow.